(WACO) – Rosie the Riveter, the World War II symbol of a woman’s working world, is still important today to Texas State Technical College alumna Rhiannon Thurmond. A small doll version of the icon is Thurmond’s travel companion on work assignments as a working manager for the regional branch of Ultimate Biomedical Solutions in Magnolia. Thurmond’s Rosie the Riveter carries a tool bag and is an inspiration for her work. Some of Thurmond’s job duties include meeting monthly preventive maintenance and corrective quotas, negotiating contracts and helping to purchase new medical devices for clients. Her work is done at surgical centers, emergency rooms and imaging centers in the Austin, Dallas and Houston areas. 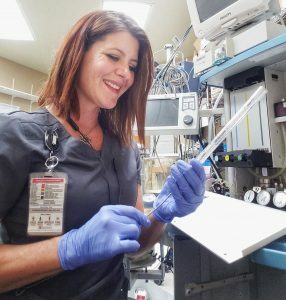 She recently received certification from Penlon, an international company specializing in anesthesia, intubation, oxygen therapy and suction equipment. Jobs for medical equipment repairers are expected to grow to more than 49,000 through 2026, according to the U.S. Bureau of Labor Statistics. The Woodlands – Houston – Sugar Land area has the highest number of medical equipment repairers in the state with about 850 workers. Roger Bowles, a TSTC instructor in the Biomedical Equipment Technology program, is encouraged by the number of jobs available in the field for graduates. Thurmond grew up in Bryan and San Marcos. She was influenced to pursue her career by her mother-in-law, an emergency room trauma nurse. Thurmond graduated in 2006 from TSTC with an Associate of Applied Science degree in Biomedical Equipment Technology. This entry was posted in Waco on October 14, 2018 by Daniel Perry.